Share a Student Concern here. Have questions? Concerned about something at UVA? Just want to talk? Visit us at our Office Hours. Tues. and Thurs., noon-2 p.m.
As many of you know, Lambeth Field originally served as the University’s first football stadium. But in 1974, the nature and the functionality of Lambeth Field changed when the University began construction on Lambeth Field Apartments, a home to over 800 students. In addition to depriving University students and Lambeth residents from the versatility and tranquility that the Field offers, the University’s proposed plan to construct a softball field on Lambeth Field would undoubtedly result in noise, light, and parking issues that would negatively impact and disturb the day-to-day lives of Lambeth residents for years and years to come. Share the following petition to save Lambeth Field! Learn more about the organizing effort on the Save Lambeth Field Facebook page. How does the University weigh the fact that some historic symbols have been rendered offensive versus an ethic of preservation and upkeep of its educational mission? What aspects of UVA’s history are under-represented? How can UVA’s history be told in innovative ways? What other institutions commemorate history in meaningful ways? The Advisory Committee will draft a report of principles for the display of historic symbols on Grounds to the Dean’s Working Group by Thursday, February 15. If you would like to provide the committee with any input on these important questions or learn more about its charge, please visit this website. UVA Lobby Day is Wednesday, February 14, in Richmond. We’ll be spending the day at the General Assembly talking about the importance of higher education and supporting UVA. If you would like to make an event zero-waste and get free plates, cutlery, cups, napkins, etc., for the event, then contact sustainability chairs at jkw7dk@virginia.edu and mcr3zc@virginia.edu. Applications due Feb. 7 at 11:59 p.m. 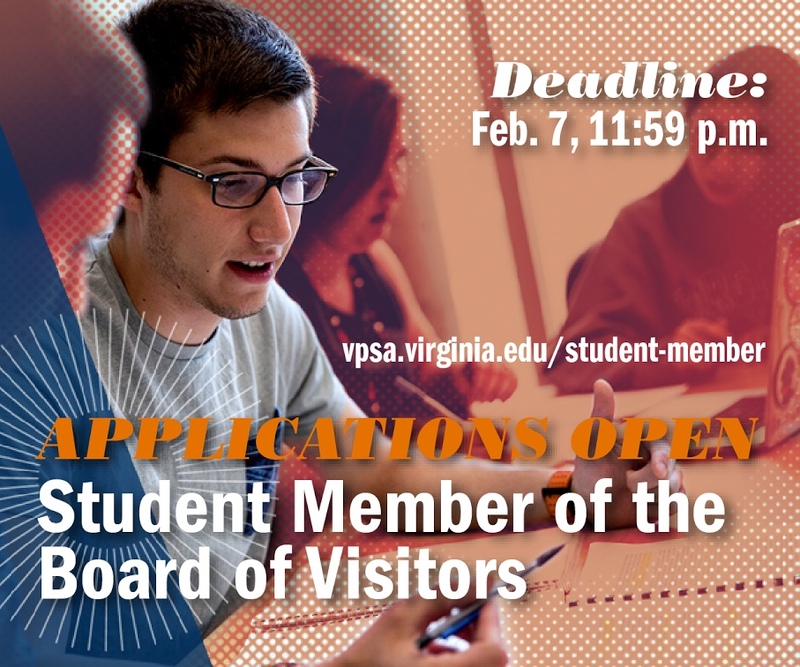 The University is now accepting applications for the 2018-19 Student Member of the Board of Visitors. The Student Member serves a one-year term as a soundboard for the Board of Visitors regarding issues that affect students at the University and must actively assess, predict, and communicate the general student reaction to Board decisions. Undergraduate candidates must be full-time students in their last year of study, and graduate candidates must be in at least their second year of study or have completed their undergraduate studies at UVA. More information and the application can be found on the VPSA website. Check out the Digital Activities Fair for organizations around Grounds that are looking for new members this semester! 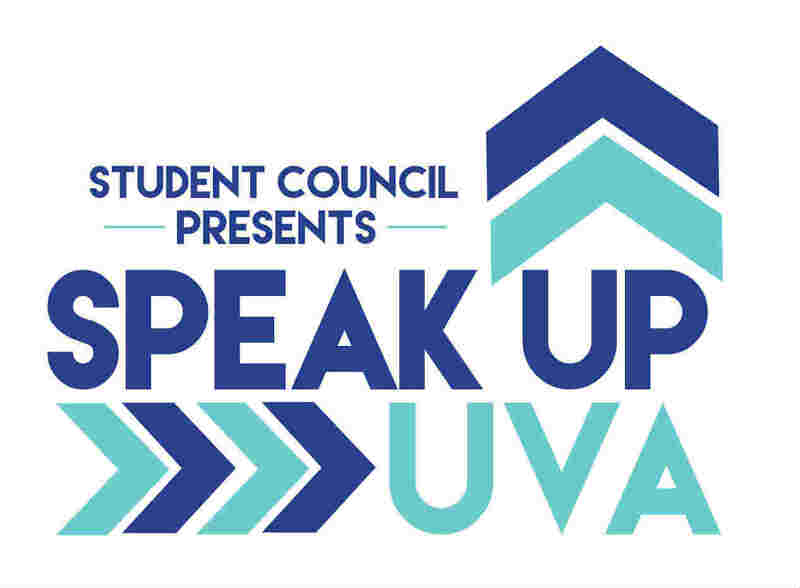 Student Council News is a bi-weekly newsletter that goes out to the UVA community, intended to serve as a resource for discovering opportunities, programs, events, and services around Grounds.